To reduce this type of interruption due to none functioning of circuit breakers in case of failure of its DC fuses to some extent, a digital circuit is designed to monitor the most essential DC supply to different protection equipment. This circuit (as below) is built around integrated circuits like timer IC555, operational amplifier used as comparator IC741, IC4510 BCD counter used for data selection, IC74LS151 multiplexer and optocoupler MCT2E. In brief, this circuit samples the DC supply available at DC fuse from all equipments and makes available at multiplexer through buffer circuit i.e., opto-coupler, for selection of the same and compare with reference voltages. A timer circuit and BCD counter circuit is used for selecting the data from breakers one by one for comparison. 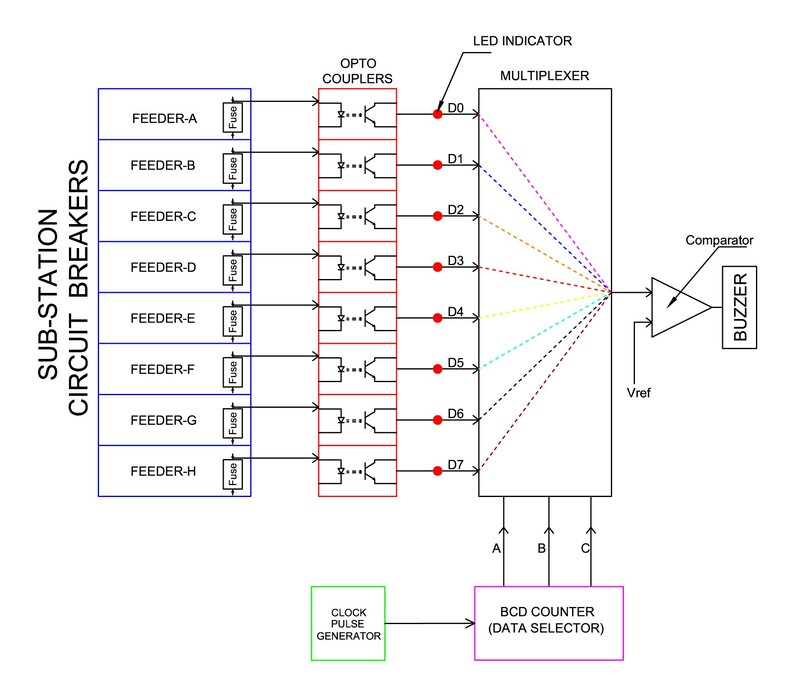 A multiplexer circuit sends the data to comparator one by one. This comparator circuit compares the data available at its terminal with reference data, which drives the buzzer to give alarm if the data is abnormal. Also LEDs are incorporated in the circuit to indicate the DC supply in the circuit breakers, etc. Similarly, a 16 channel multiplexer IC can monitor DC supply of 16 equipments at a time. This circuit costs around Rs. 2,000/-. Annunciation /alarm system in this circuit will alert the operator within few seconds/minutes, as per settings, after failure of fuse. This helps the operator to take necessary action of informing the concerned officers and replacing the fuse immediately. In turn this helps to avoid the unnecessary interruptions during faults.